The feature film UglyDolls will debut in USA theaters in about a month, the first film that sees the well known toys on the big screen. Below the new and complete trailer. A series of plush toys began as an idea from a long-distance letter between the creators David Horvath and Sun-Min Kim, forn in 2001 and awarded as Specialty Toy of the Year by the Toy Industry Association in 2006. Now its time for the digital version, with a film produced by Original Force, STX Entertainment and Robert Rodriguez's Troublemaker Studios (Alita Battleangel), directed by veteran Kelly Asbury (Spirit, Shrek 2, Gromeo & Juliet end Smurfs: The Lost Village). 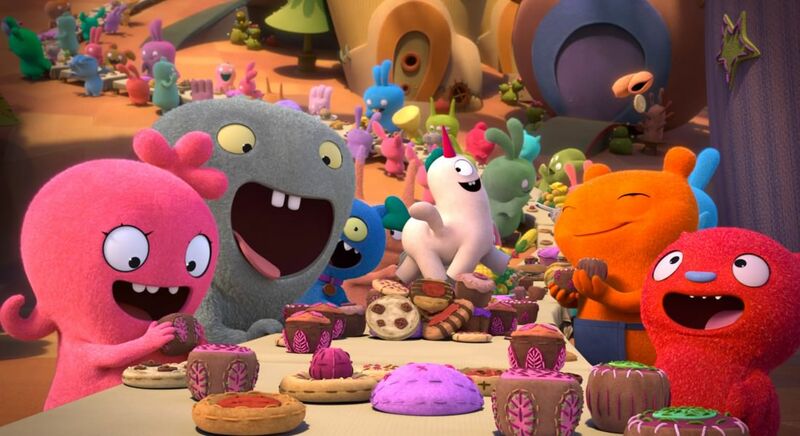 The story is set in Uglyville, the colorful and sunny city where UglyDolls live, having fun and singing all day long. But what happens if some of these are brought to a city where reigns rule and order? A musical comedy dedicated to a young audience that features original song by Kelly Clarkson, Nick Jonas, Janelle Monáe, Blake Shelton and Pitbull, in the theaters < b>May 3rd in the USA and then in many other countries in summer.